In 1868, a newpaper editor named Christopher Sholes filed patent no. 79868, titled, “Improvement in Type-writing machines.” The patent represented one of the earliest incarnations of what we now call a typewriter. Sholes’s invention wasn’t the first typewriter ever (this badboy was the first), but it was the first typewriter invented by an American. There were only two rows of keys, with the letters essentially placed in alphabetical order. However, it didn’t take long for Sholes to realize the the layout was clumsy and inefficient. Several iterations later, he settled on the keyboard layout we know today–QWERTY. 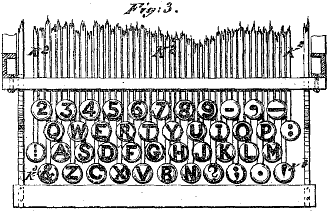 The QWERTY keyboard became popular with the Remington no. 2 typewriter in 1878, and it’s become the standard for nearly all keyboards today. The second theory relates to the people that were using typewriters in the earliest stages of their use. Many typewriters were used by telegram operators, who often translated and transcribed morse code. The theory maintains that earlier keyboard layouts made this process difficult and the QWERTY keyboard was designed to eliminate these problems. Both explanations seem reasonable, but the real point of the matter is this: After more than 100 years, we still rely on the QWERTY keyboard despite the fact that it was designed to solve two problems that haven’t existed for years! If you want to dive into a raging online debate, just ask the internet which keyboard layout allows for the fastest, most efficient typing. The most prominent alternative to QWERTY is the Dvorak keyboard layout, but neither QWERTY nor Dvorak fans can offer conclusive evidence to prove which is better. I don’t have any data to show what percent of computer users have switched to Dvorak, but I can almost guarantee that you would do a double-take if you happened to see someone using that keyboard. The QWERTY keyboard is NOT optimized for the letters that are used most frequently. For example, “J” and “K” are two of the letters used least frequently, yet they take up some of the most important real estate on the keyboard. The result is that you often have to stretch and strain to reach keys with a QWERTY keyboard when Dvorak would allow you to move your hands less. The most commonly used letters of the alphabet are nearly all located on the “home” row of the Dvorak keyboard. With so many people working at computers for their entire careers, repetitive stress injuries (like carpal tunnel syndrome) are very common. Switching from a QWERTY to Dvorak keyboard layout is one of the most effective cures for this type of injury. Dvorak requires you to move your fingers/hands less while typing and requires less “hurdling” where you have to stretch to another row of keys. Despite these potential benefits of Dvorak, and that fact that it’s just as efficient and easy to learn as QWERTY, nearly every keyboard uses QWERTY. The primary reason QWERTY is so common is basically because it’s so common. If I buy a new computer, it’s QWERTY; if I borrow a friend’s computer, it’s QWERTY, if I sit down at a library computer, it’s QWERTY. Anyone who tries to make the change to a new keyboard layout will face the obstacle of QWERTY’s ubiquity. But I didn’t give you this long-winded explanation of QWERTY and Dvorak because I think you should switch keyboards. The unquestioned traditon of the QWERTY keyboard is a useful analogy for so many mindless habits that we allow to determine the trajectory of our lives. Millions and millions of people have learned the QWERTY keyboard, and I would guess that a very low percentage of them ever questioned why they should use that layout and whether there may be better alternatives. It’s common for our minds to work this way–it’s easier to follow old habits and traditions than to create our own paths. One of my longest standing goals has been to develop a habit of waking up early. I’ve tried and tried to make it work, but I’ve only seen some rollercoaster success quickly followed by failure. The problem is a longstanding habit–an old, harmless tradition–of going to bed too late. Late bedtimes have always worked for me and I didn’t see a reason to change them, but the truth is that I’ll never be able to wake up when I want to unless I go to sleep earlier. If you have status quo behaviors like this in your life, try to change them! Challenge the habits that you’ve come to accept, always look for alternative ways to do things, and you won’t make the mistake of settling for your outdated, less than ideal traditions. Have ideas about old habits you’d like to get rid of? Share your comments below and I’d love to discuss with you!